﻿ Sewah Studios - Ohio. Find It Here. In 1927, a man of vision and foresight became intensely interested in the possibilities of roadside historical marking. 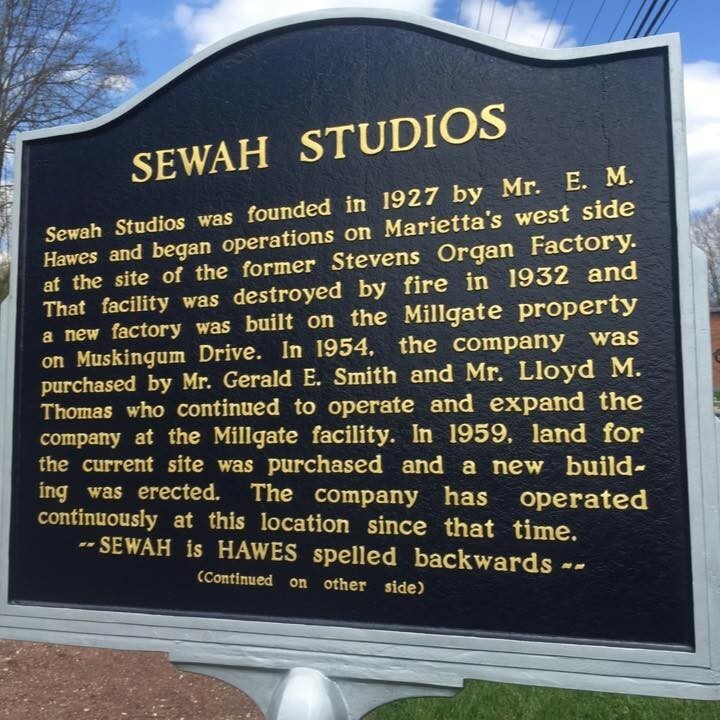 In Marietta, Ohio E. M. Hawes founded a small sign business in an old organ factory, and named it Sewah Studios, his name in reverse. With his interest in sales, copy-writing, and history, Mr. Hawes wanted to develop a roadside marker program for automobile tourists.Ninety years ago, using cast aluminum was unheard of to make historical plaques. Bronze, wood and ferrous metals were primarily used, but none of these were practical for the long term. Bronze was too expensive, ferrous metals were subject to rust and wood could not stand up to the elements.The lack of practical materials made the value of a widespread marker program questionable. Rather than invest in something which could prove more of a liability than an asset, the state and local historical societies confined their activities to research and compiling data. History was being preserved but not publicly shared. That was all about to change.